Asian Americans are the fastest growing racial/ethnic grouping in America, with a population of 20 million in 2014 that is projected to double by 2050 to 40 million. How will the American church be prepared? 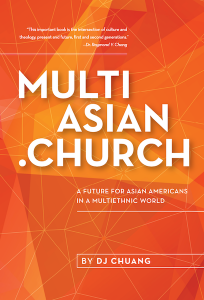 MultiAsian.Church is a strategic guide for ministry by Asian Americans, for Asian Americans and non-Asians too, in a multiethnic world. Sovereignly having a bicultural background, many next generation Asian Americans are uniquely adaptable to navigate in our racialized society in a hopeful and Gospel-sharing way through a growing number of next generation multi-Asian churches, a new phrase to describe this new kind of multiethnic church that are led by Asian Americans. DJ Chuang has packed this book with the latest demographics, statistics, real-life examples, stories, and recommendations to quickly inject the reader with pertinent information for ministering among the fastest growing racial ethnic group in America. MultiAsian.Church is available both as a digital edition (Amazon Kindle | Nook | iBooks | Kobo) and a print edition (amazon.com | bn.com). You can preview the book and connect with the author DJ Chuang. 100% of proceeds go to Thirty Network towards advancing Asian American church leaders for a multiethnic world. You may donate online to accelerate the work of Thirty Network via Ambassador Network.